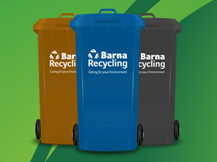 Welcome to Barna Recycling, your Number One Environmentally Friendly Waste Collection Provider. How can Barna Recycling help you today? You can trust Barna Recycling to manage all of your waste management services. General household or commercial waste, organic or recyclable materials, you can depend on Barna Recycling to take care of it all. environmentally friendly service, every time. Switch to Barna Recycling today and save! 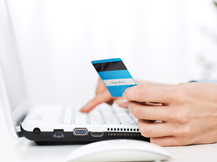 Log-in to your personalised customer account today! Notice for Change of Collections! In order to catch up on the collections that didn’t take place last Thursday and Friday, our trucks are doing double shifts Monday, Tuesday and Wednesday this week. We hope to have most of the backlog cleared by Wednesday night. 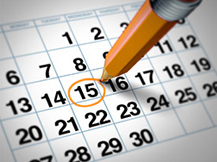 We will let customers know by text or email on the day prior to the collection taking place where possible. We thank you for your co-operation while getting the backlog cleared. Easter break is fast approaching and could be a good time to start encouraging the kids to begin recycling at home. Schools are putting a great emphasis on recycling through the green flag initiative and are educating kids on the long-term benefits recycling will have on the planet. So why not carry this education about recycling in to the home by making it fun & by encouraging creativity. Recycling should not feel like a chore for you & your family. Below we have listed out some fun initiatives to encourage recycling in the home. Barna Customers have downloaded our app and are using it on a regular basis. Why not join them! Did you know that over 60,000 homes in Connacht choose Barna Recycling to look after their waste? As Connacht’s leading provider in waste management services we guarantee our customers a professional, reliable and environmentally friendly service. Not just with your household waste but at your local civic amenity site too. 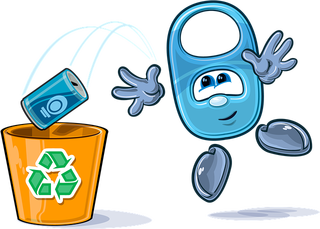 The benefits of recycling are widely publicised but getting into the recycling habit can be difficult to start. Below we have outlined some tips and advice to help improve your recycling habits. Recycling costs you a small amount of time separating and washing out your recycling materials but can really make a huge impact on your pocket and the environment. Many of the recycling materials can be re purposed into new products. At Barna Recycling we are feeling festive, from decorating our homes, Christmas shopping, watching Christmas movies and spending time with friends and family. Christmas is a busy time of year for all of us. 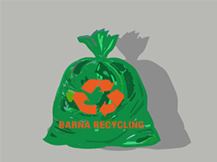 Barna Recycling are committed to providing our customers with a reliable, consistent and value for money service.